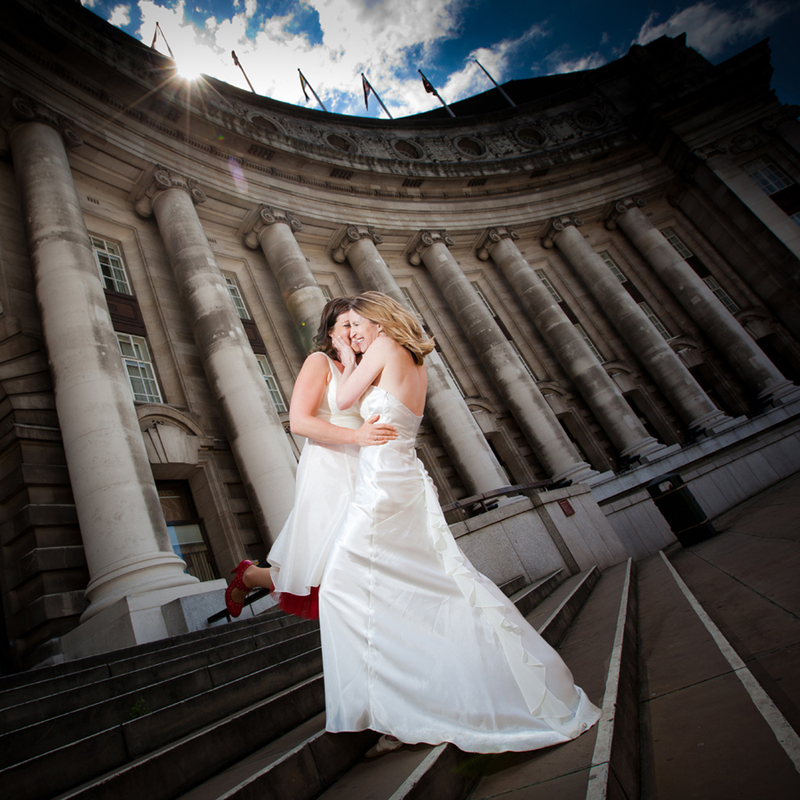 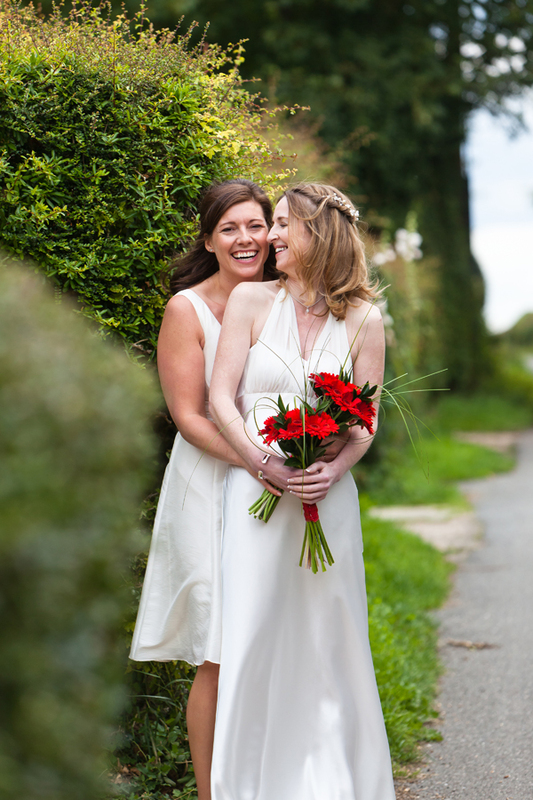 Kelly & Debs are two wonderful people who had a fantastic day. 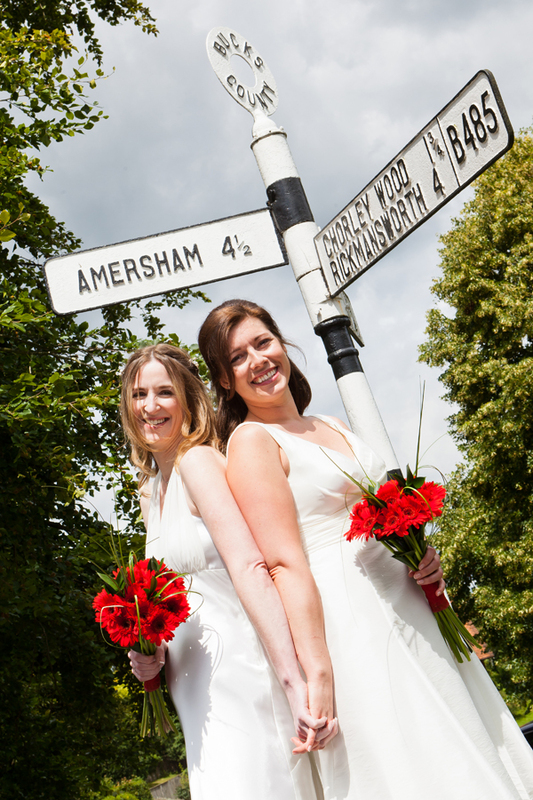 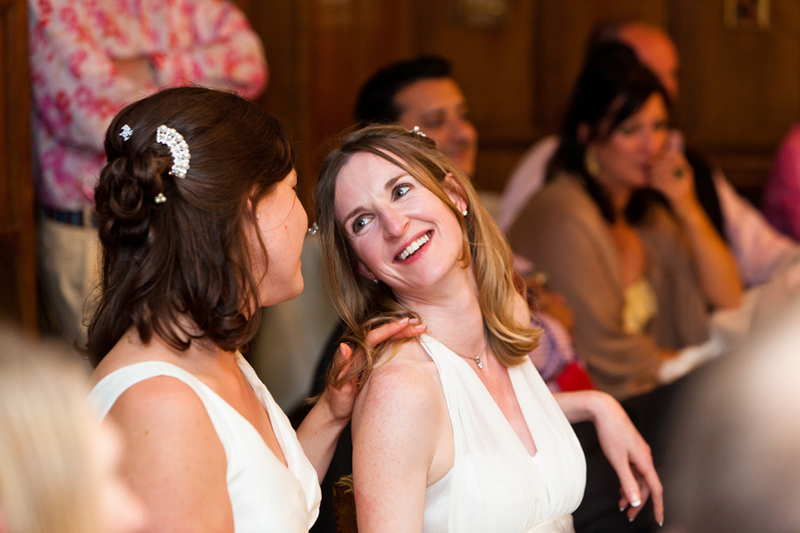 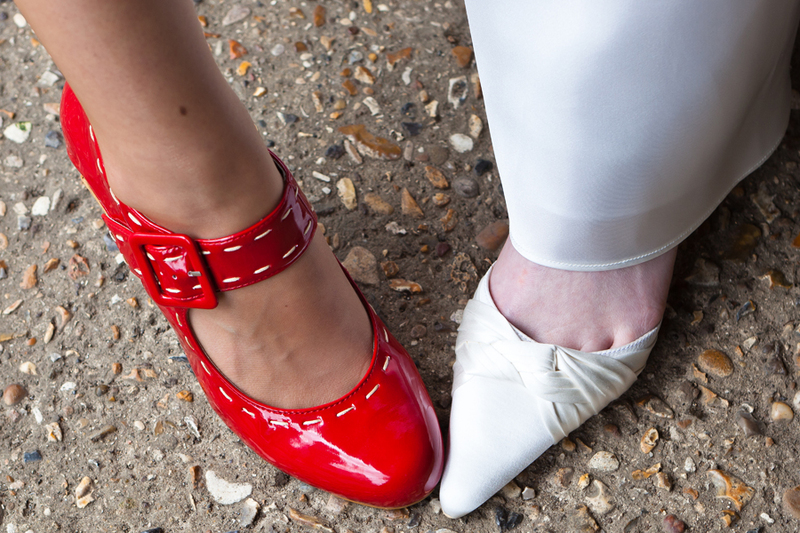 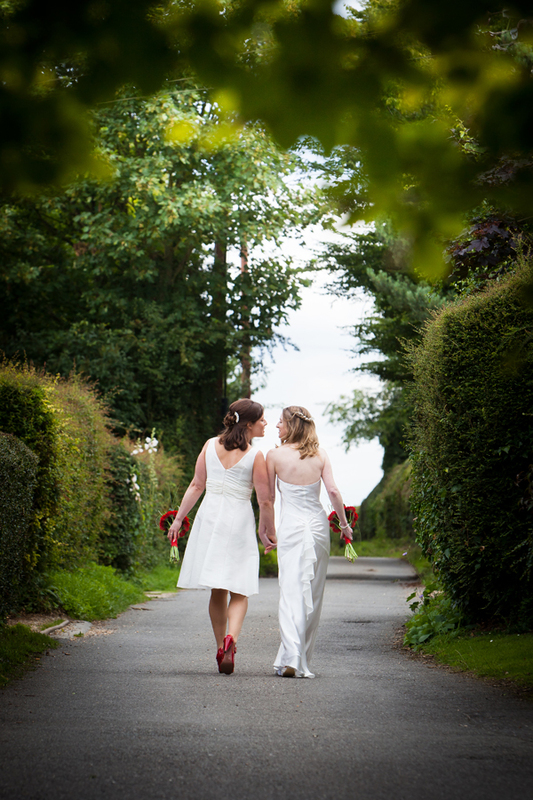 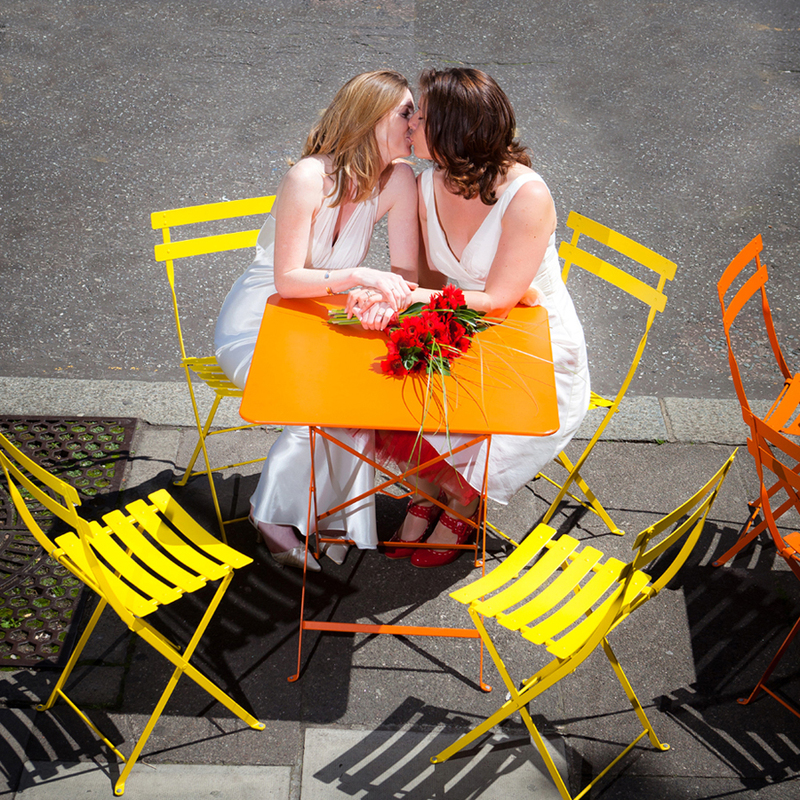 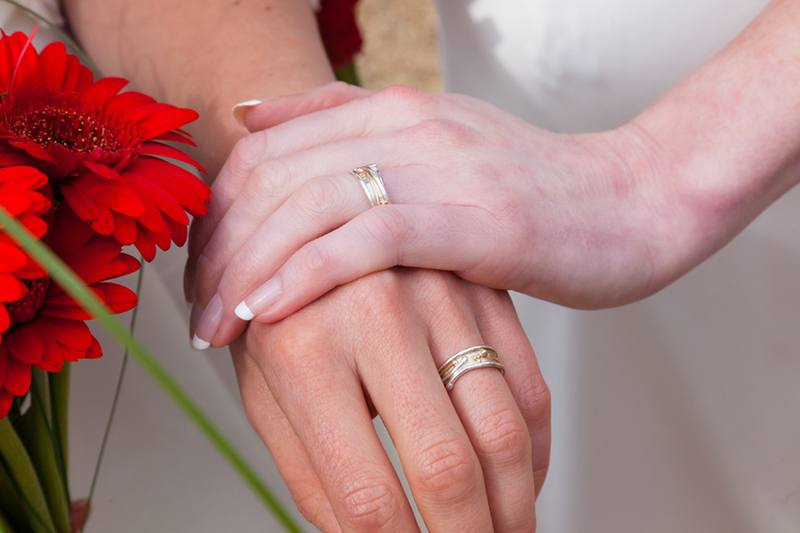 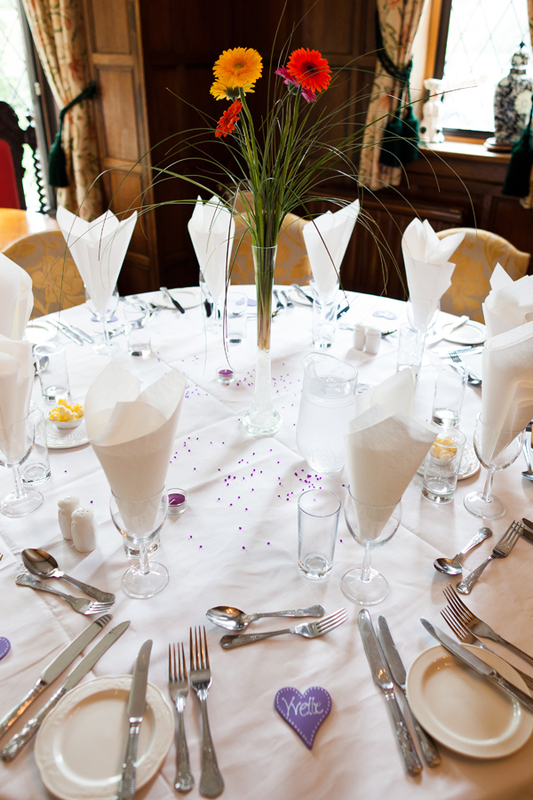 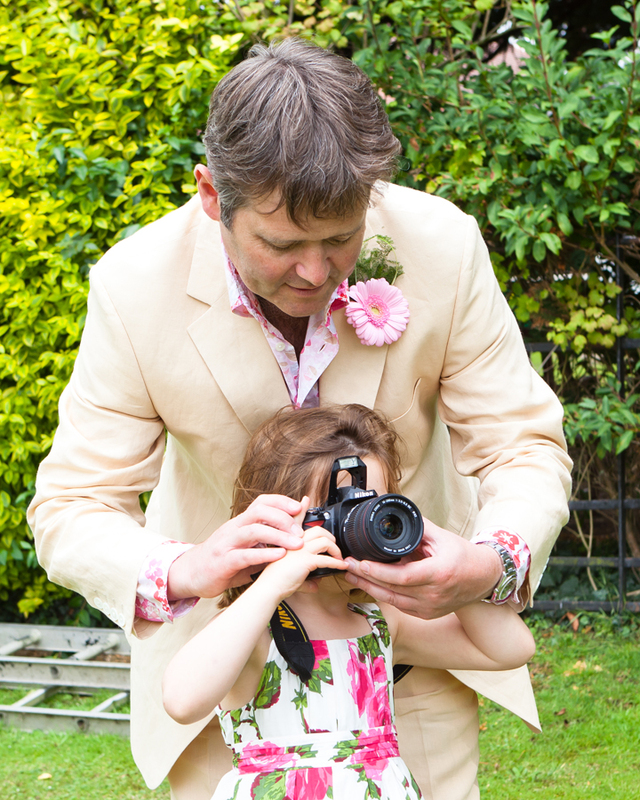 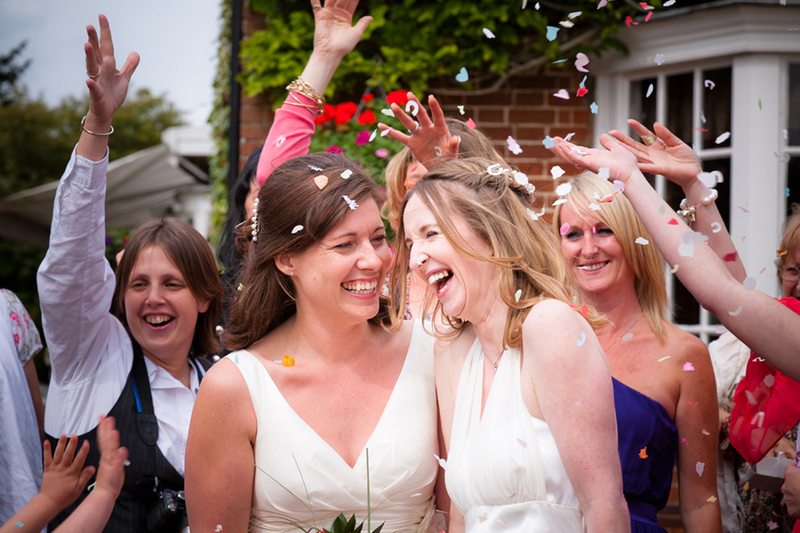 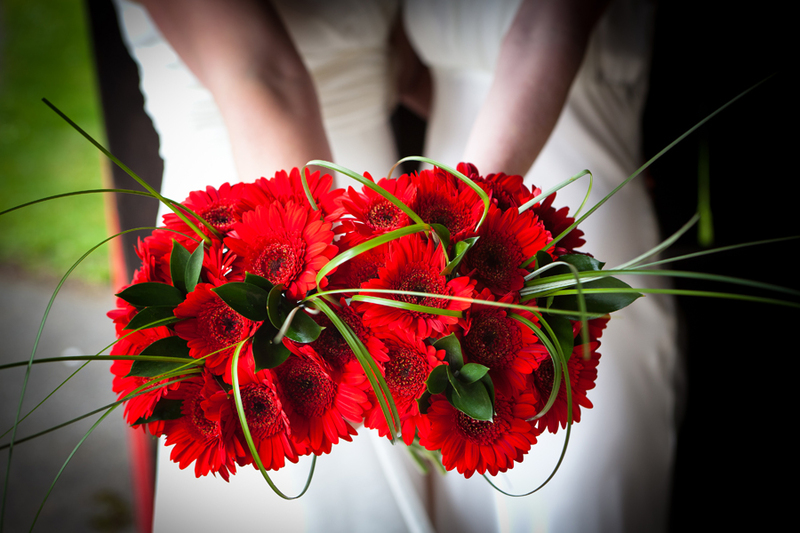 We were in Hertfordshire, the Bedford Arms at Chenies to cover the civil partnership of Kelly and Debs. 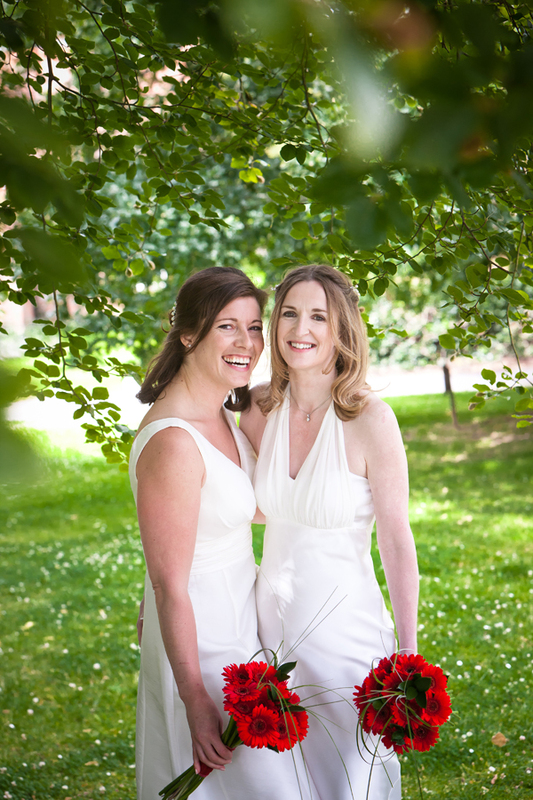 This was extra special for me as Kelly had been a former assistant of mine back in 2008. 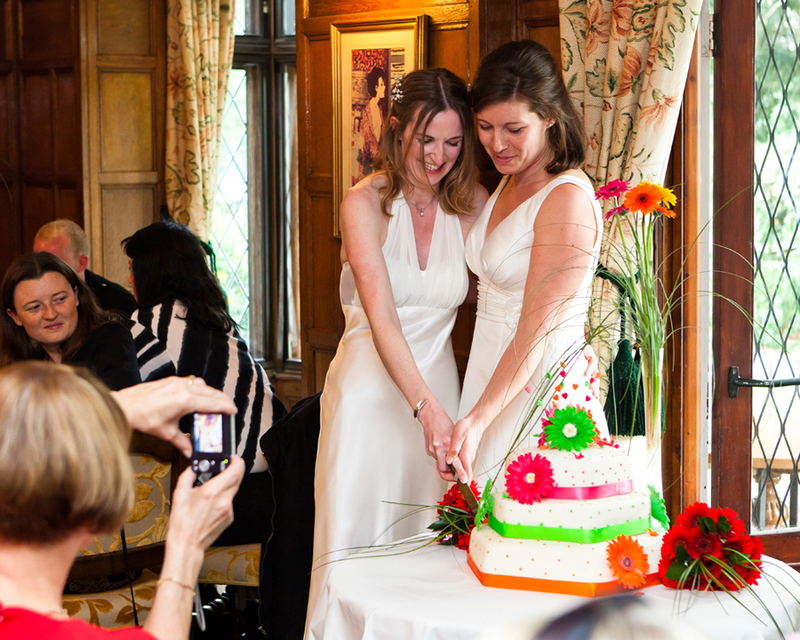 Not only were we shooting the wedding but Susan and I were invited guests. 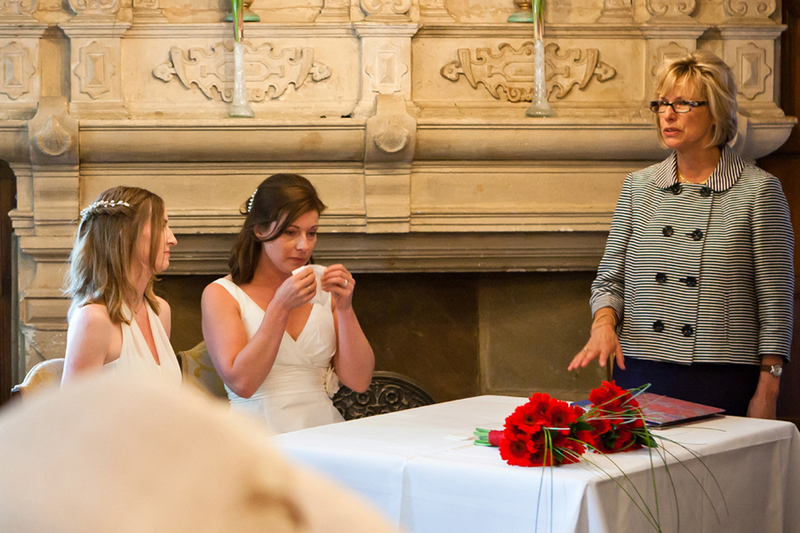 After traveling down the day before, we met with the girls on Friday evening to discuss and clarify what would be happening the next day, and then it was off to theirs for an informal BBQ, and an opportunity to meet and greet some of the guests. 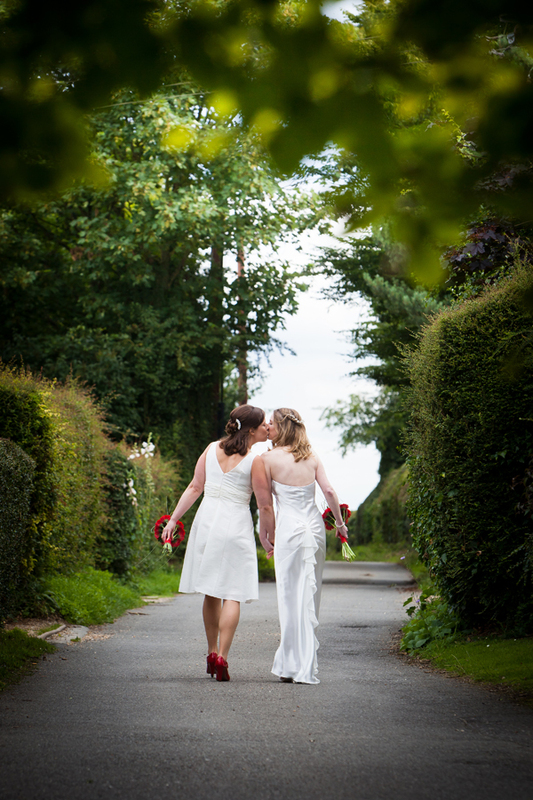 The wedding day was perfect. 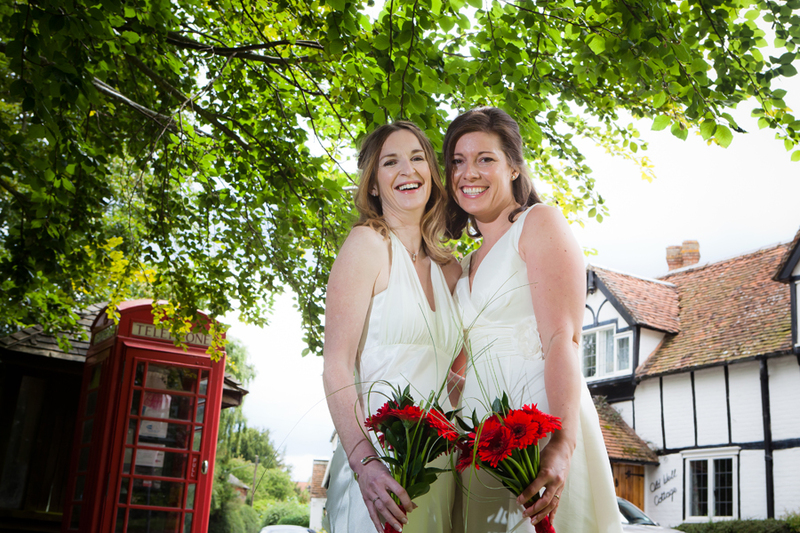 The girls wanted to relax with their guests following the ceremony, so we took the “couples only” shots beforehand,utilising the village bus stop, red telephone box, village green and country lane to very good effect. 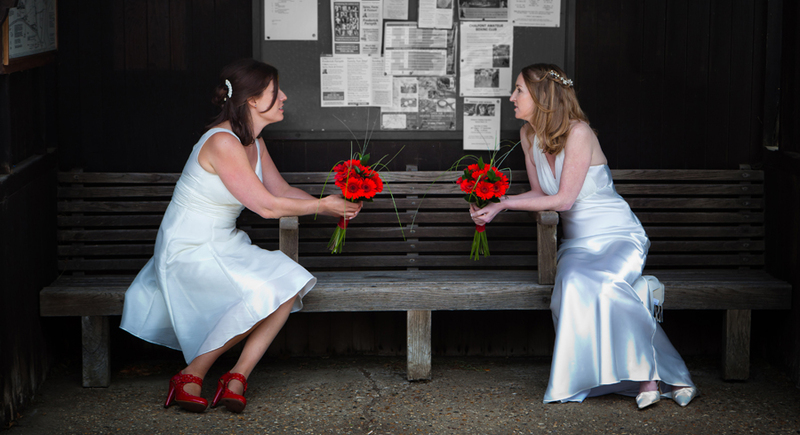 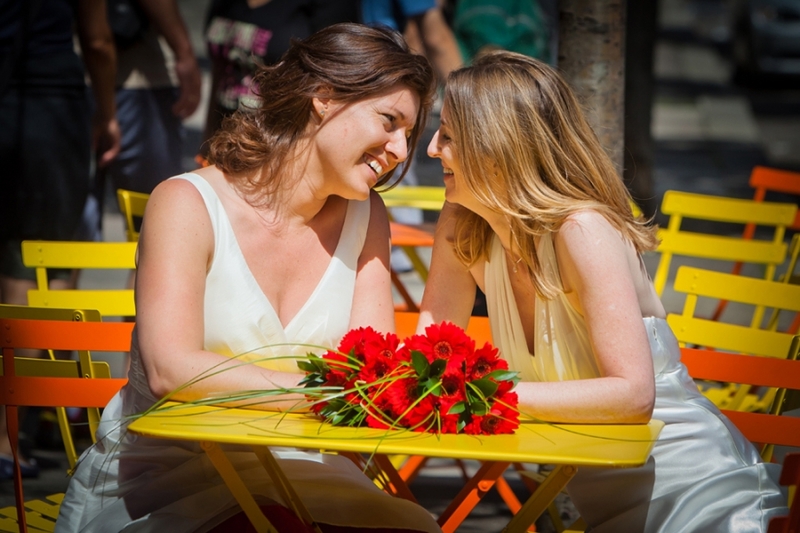 Kelly and Debs, both wearing beautiful but different wedding dresses, were escorted into the ceremony by their dads, and then sat facing their family and friends. 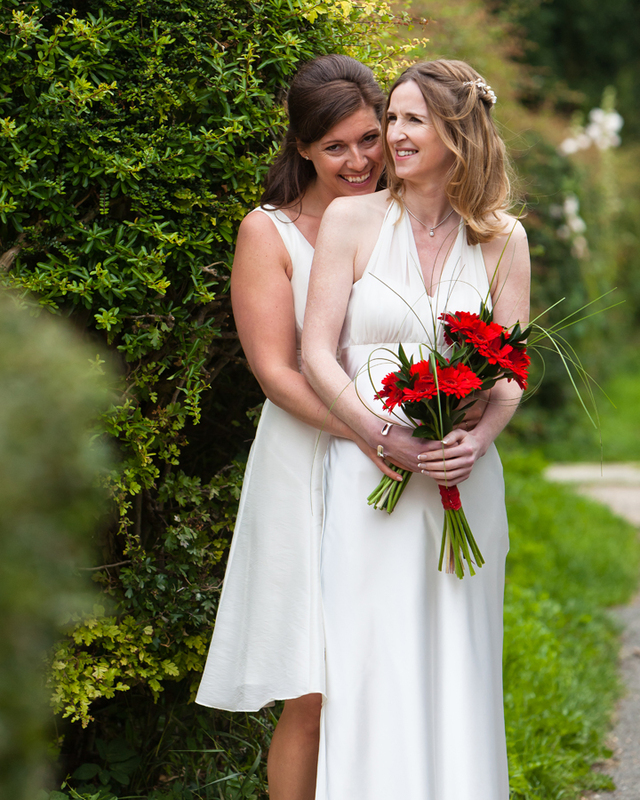 The ceremony was made very personal by the registrar and was all about Kelly and Debs as a couple, their love, friendship and commitment to one another. 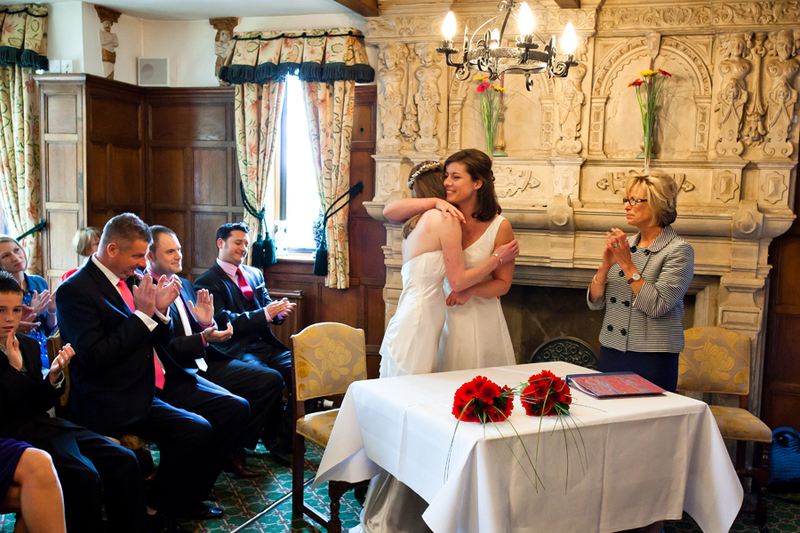 Very emotional, as all good weddings are !! 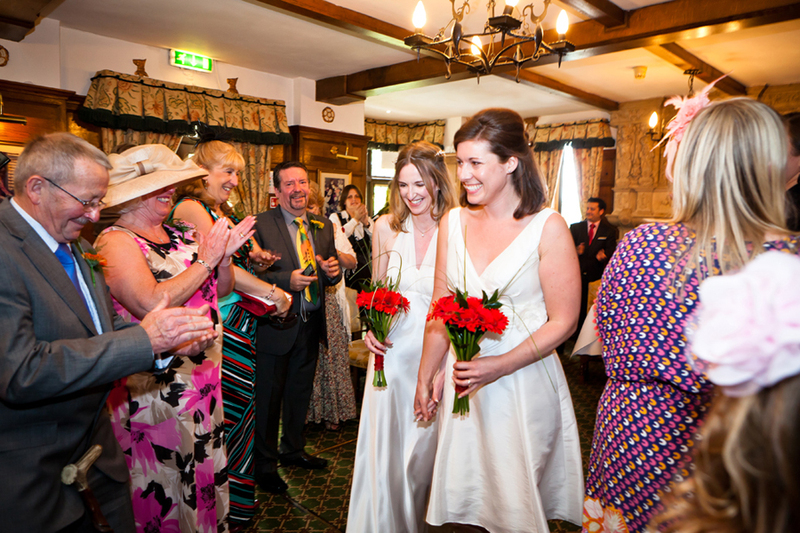 After the ceremony, the guests all filed out and into the gardens of the Bedfords Arms and were greeted with a glass of Pimms and Phil (a popular name at this wedding) who was dressed in full Scottish regalia and playing the bagpipes. 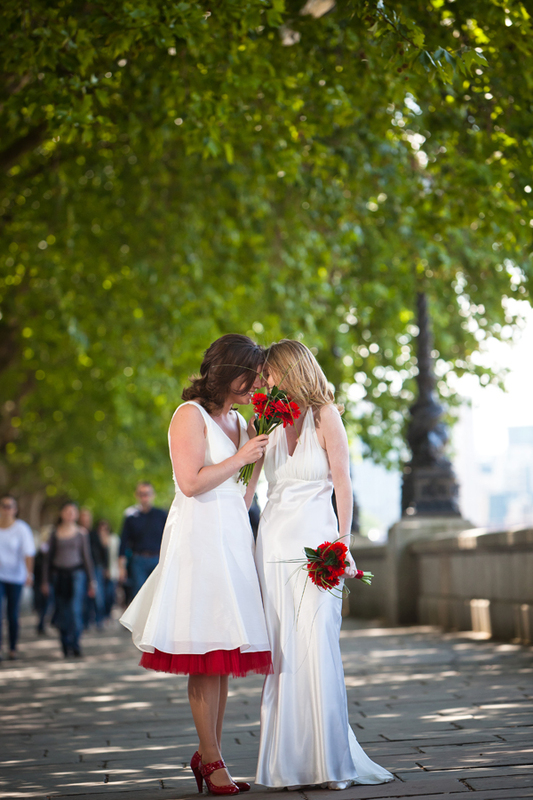 The scene was stunning, and a great addition to the photos. 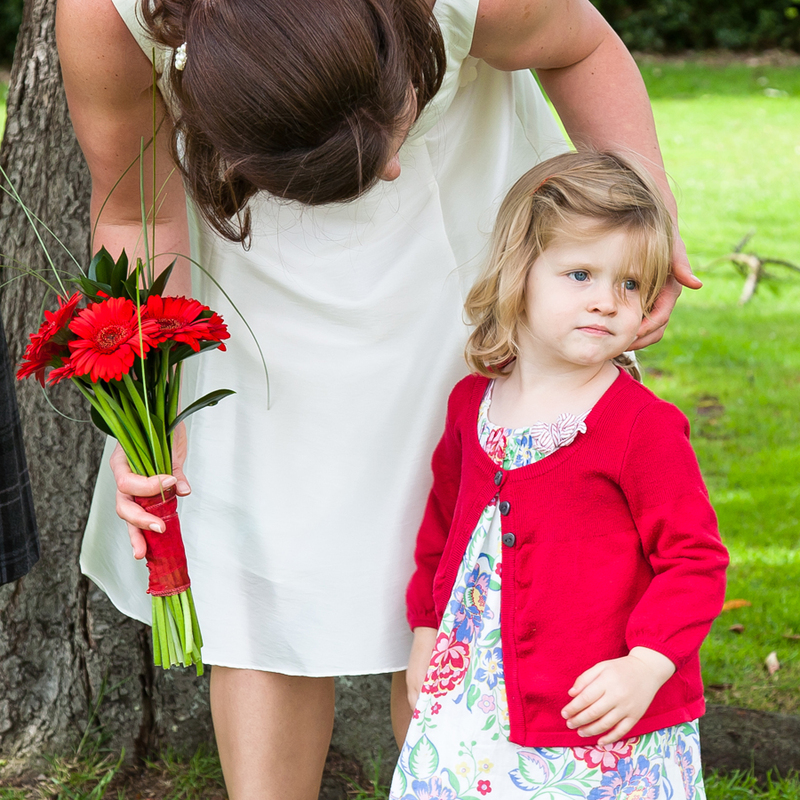 While they mingled with their guests we enjoyed getting the formal group shots taken and catching the candids. 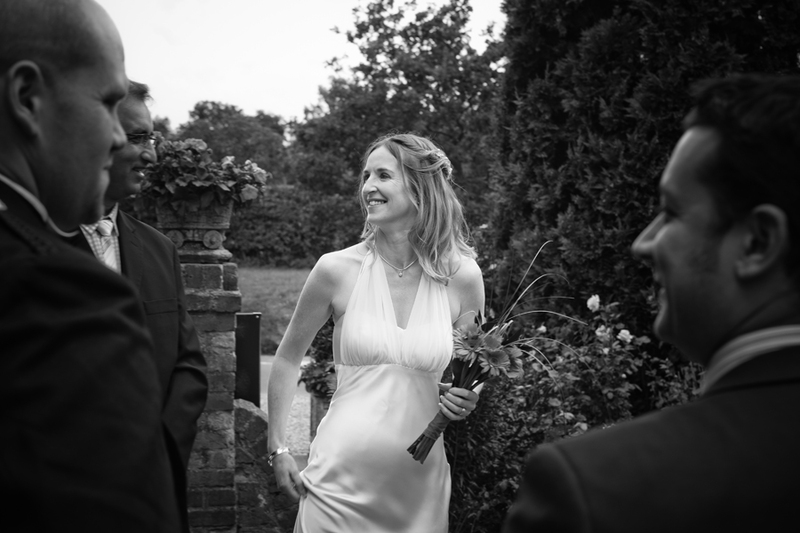 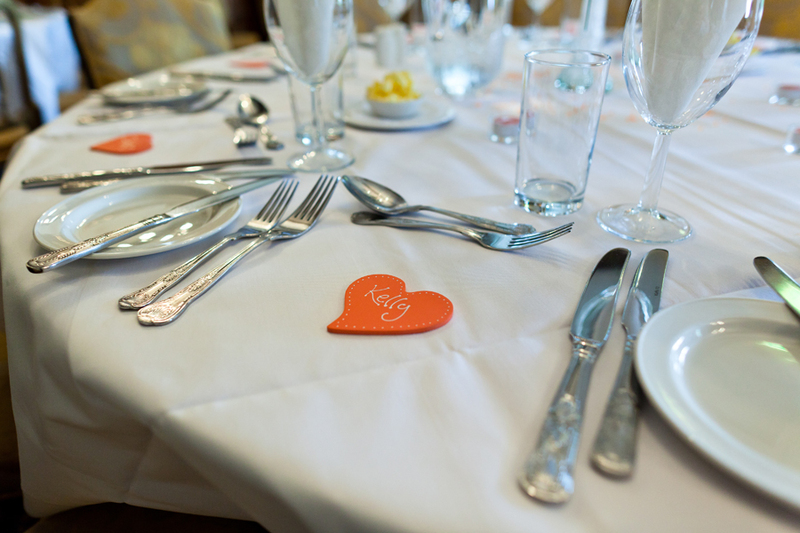 The day had a lovely feeling of intimacy to it, the atmosphere amongst the guests was very relaxed which allowed us to get some fabulous shots that really captured the day. 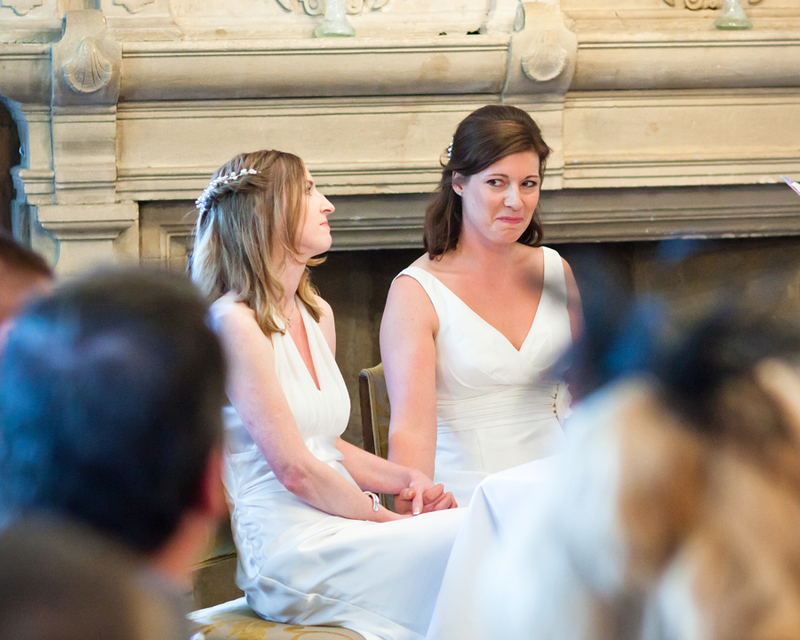 The speeches were from the heart and again a few tears were shed. 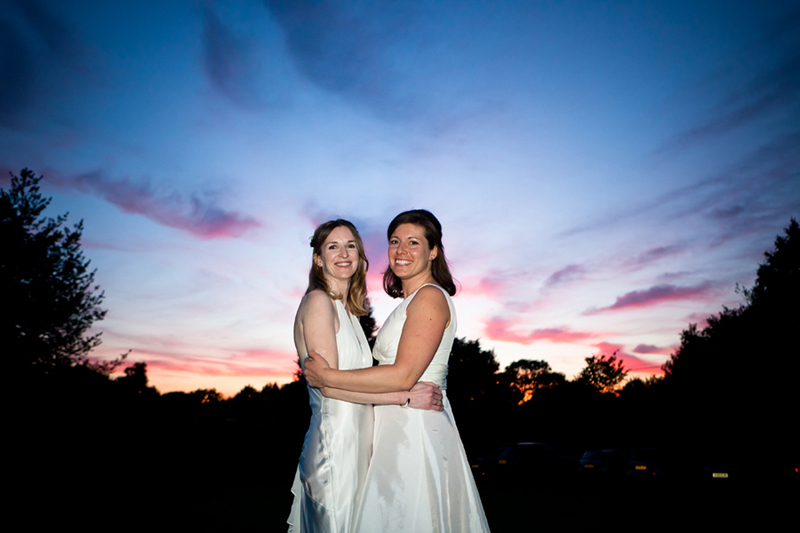 The day time flowed into the evening with more guests arriving, and literally with the setting sun the dancing started. 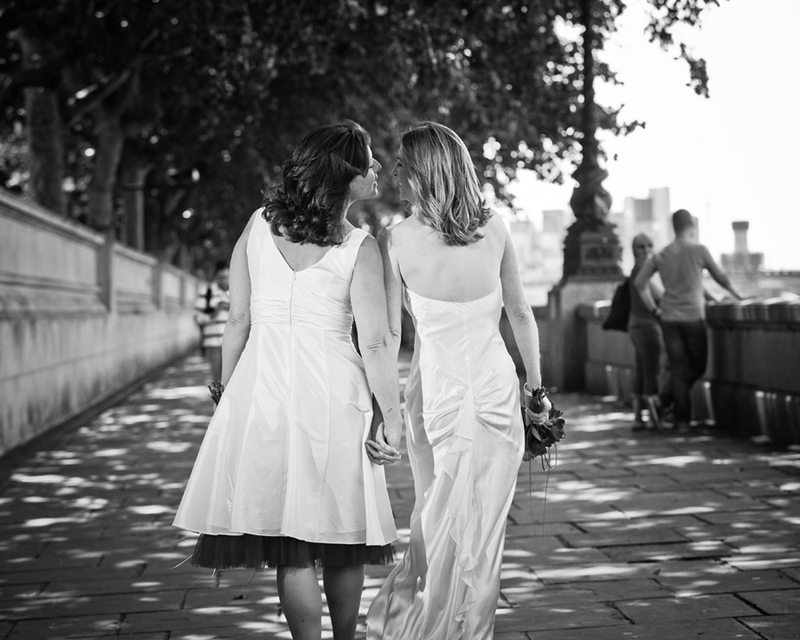 That wasn’t quite the end of things, …….. the next day we were up for a morning in London. 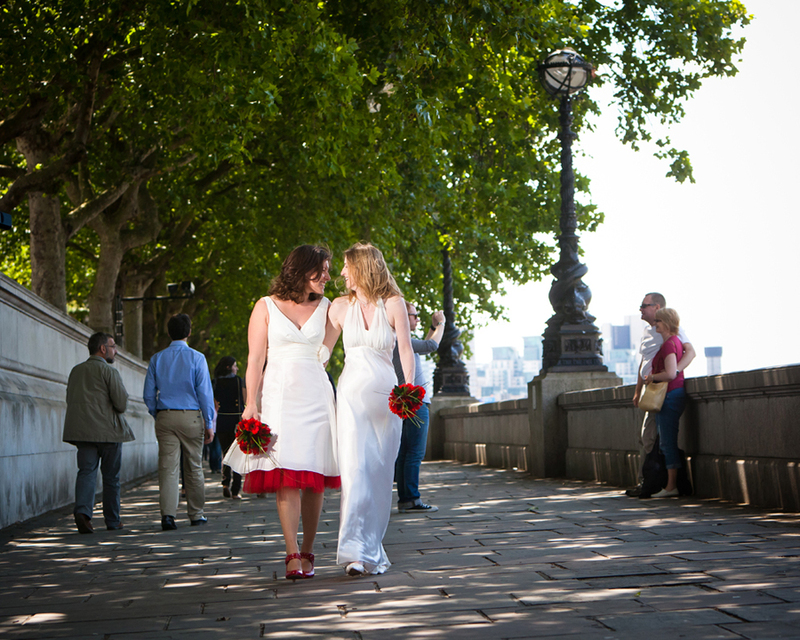 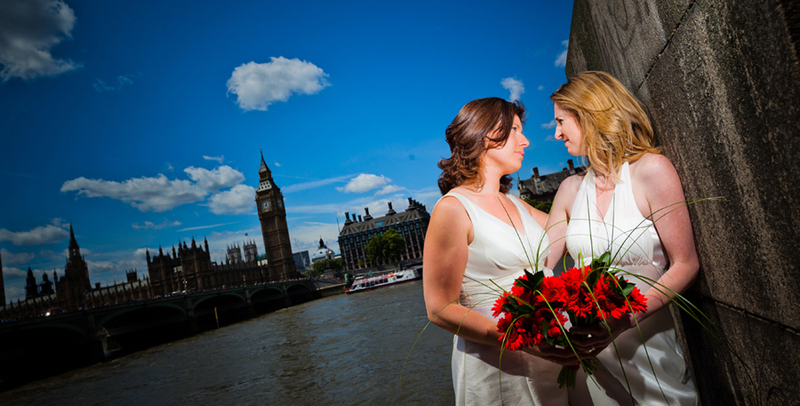 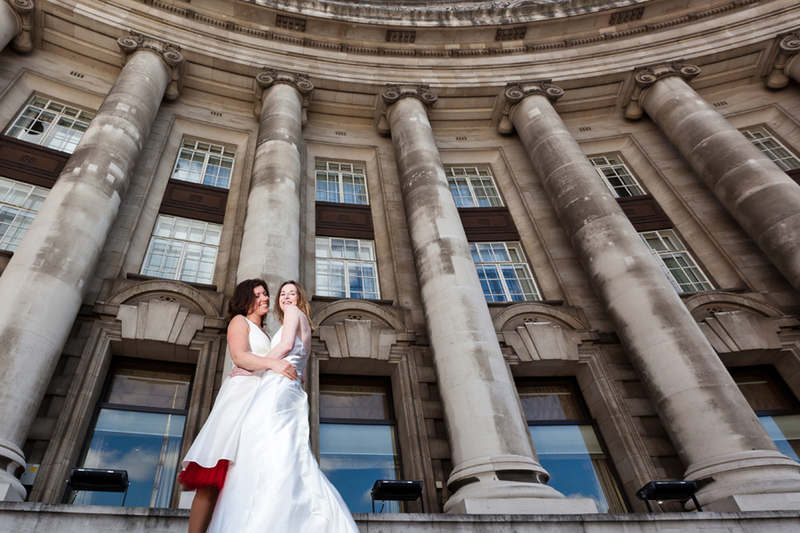 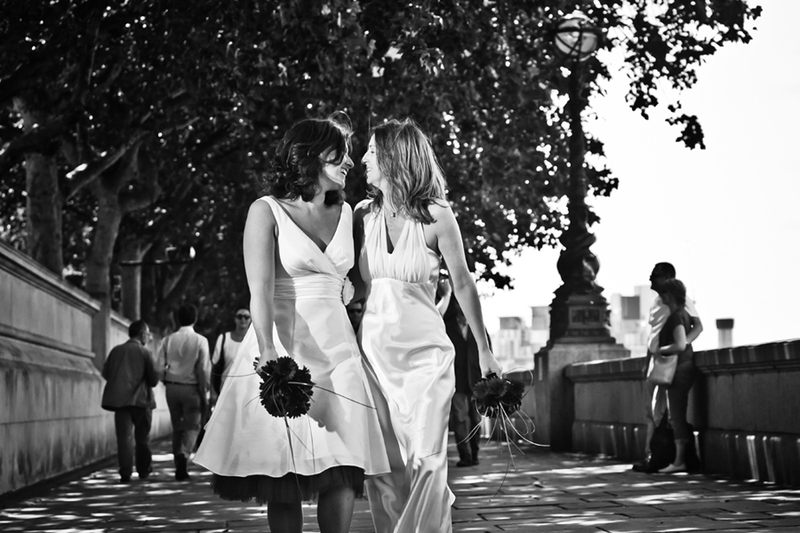 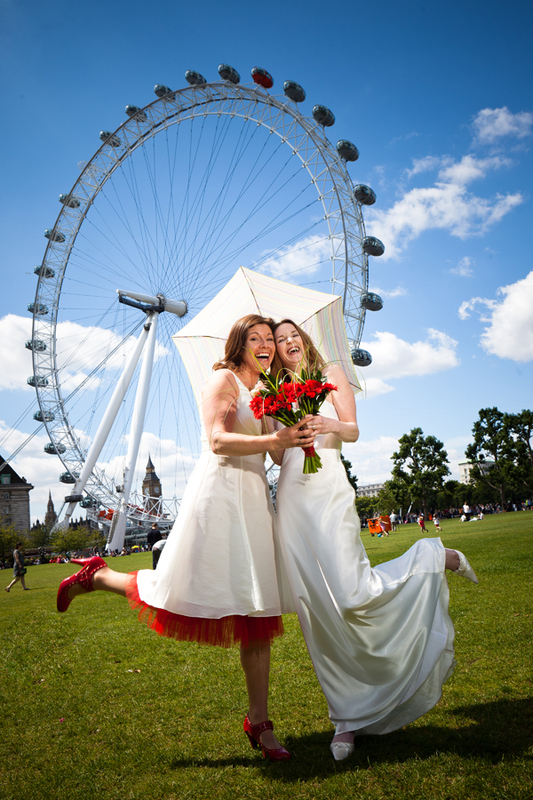 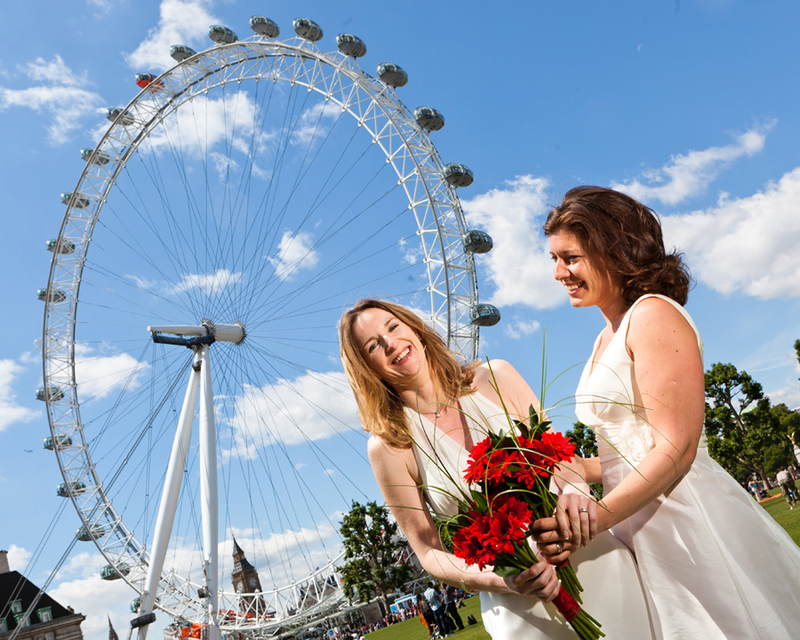 Dresses back on and bouquets at the ready for some funky fun shots using the London Eye, Houses of Parliament, Big Ben, the Embankment, County Court and a street café as back drops. 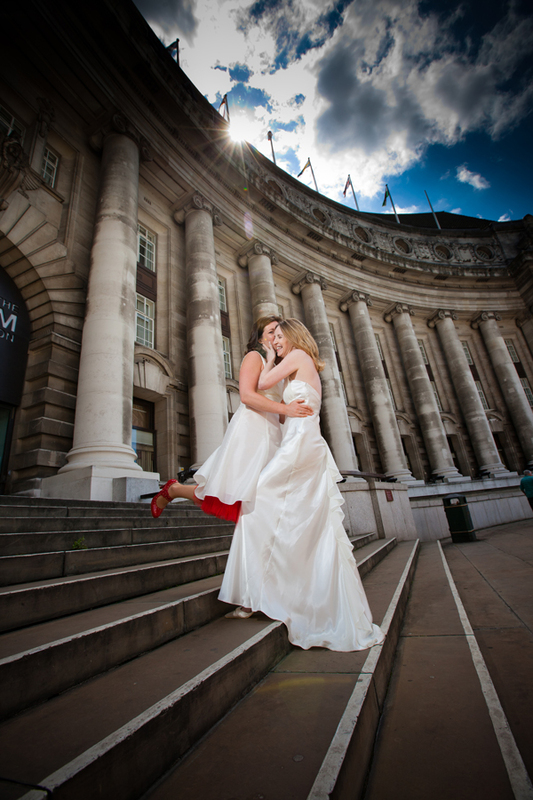 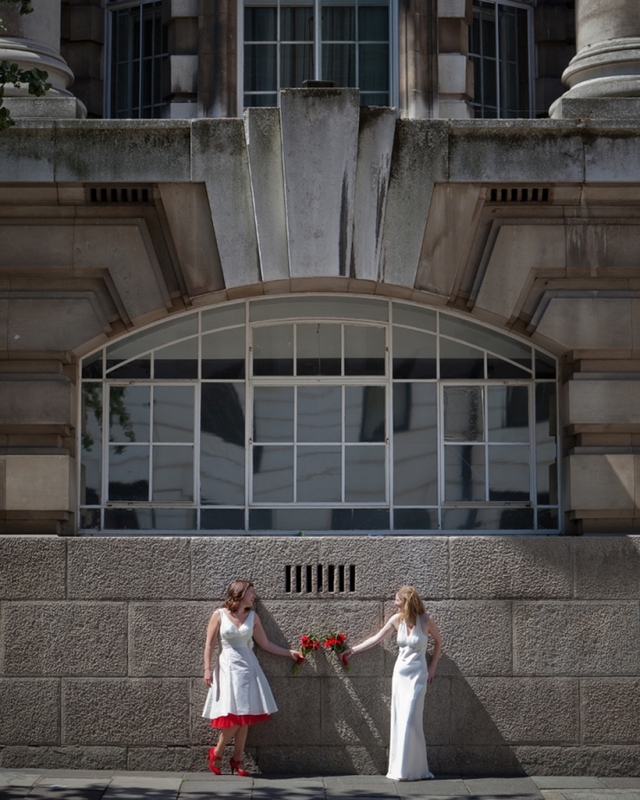 The place was teaming with folks and the girls received quite a bit of attention when being photographed especially when they managed to climb over a fence on the Embankment – no mean feat in a wedding dress. 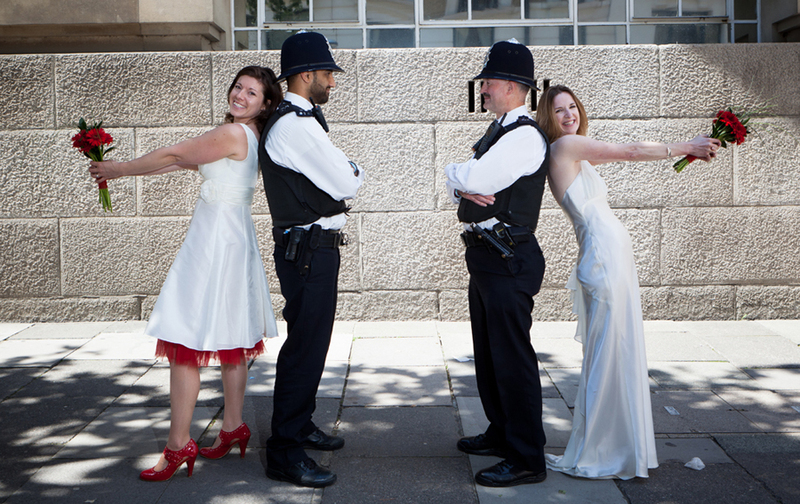 We even managed to cajole two London bobbies into one of the shots !!! 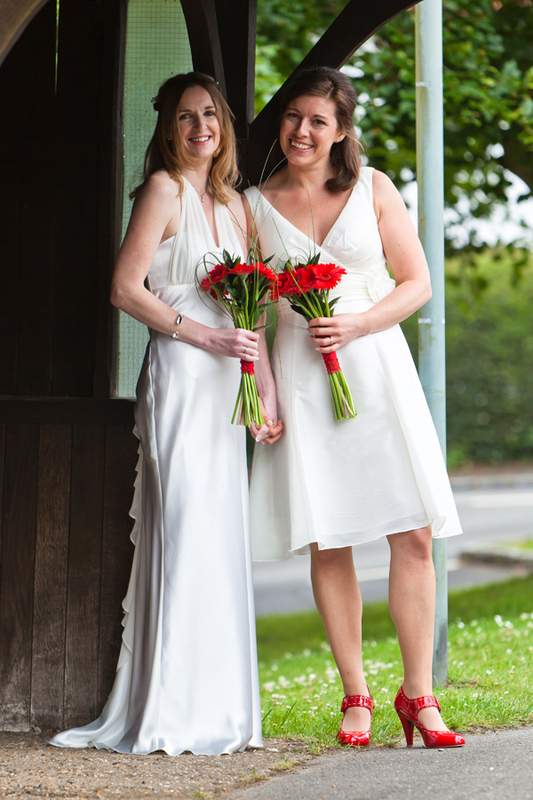 We do wish them both the very best on their life journey together. 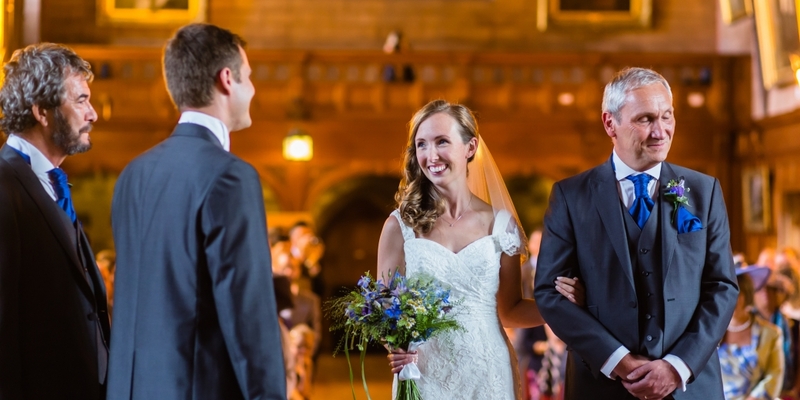 © 2019 Philip Ryott Photography|ProPhoto Photographer Site by NetRivet, Inc.